Building my Media Empire, One Tiny Step at a Time. I’ve been out of the blogging loop for awhile. While I’ve been finishing up my MA in English Literature and 18 MA hours in Psychology, my own fiction writing (who am I kidding? My own life in general) has taken a hit. And, like the people frustrated with academia everywhere, I am currently without student loans or a job while finishing my thesis and defense due to “circumstances beyond my control.” That is, issues with my thesis committee and with my university’s administration. Let’s just say, it’s enough to make the calmest and most Zen person feel stabby. I will also be launching a Youtube channel soon under the name of “Eyefeelstabby,” which will present an often tongue-in-cheek view of the world of perimenopause, where we will discuss views of middle aged life in general and the things that make us feel stabby. We will also have stabby crafty segments, stabby reviews (of movies, books, etc. ), and whatever else just needs killin’…I mean, discussed. In 2006, my husband created Project 2,996. This is the 10th year that Dale–and many others–will spend time on 9/11 remembering those killed not by how they died, but by reading about how they lived. Dale created Project 2,996 in 2006 and recruited more than 2,000 other bloggers to help him. 10 years on the internet is an eternity, but many of the posts are still up. Please take a few minutes to read and focus on the lives of 2,996 people. Ten “Vital” Novel Writing Tips? I’d like to take each one of these points and “dissect” them a bit. Please feel free to add your own comments about any of the points made that you like, or that you don’t like. 1. While agents and editors may need to strictly categorize your novel, this assumes that all novelists are traditionally published. Many authors choose not to go through a publishing company because their book may fall outside of their guidelines. That said, it is a good idea to keep from flying so far outside the realm of category that you can’t define your genre with a few keywords; even independent publishing platforms like Amazon want authors to categorize their books. 2. Suggesting that today’s novels are more like movies than ever isn’t all that complimentary. I’ve read a few books that I could tell from the start were written with the idea that they would be adapted to film. To be frank, they stank as books, and didn’t smell much better if one or two were adapted for the big screen. Books aren’t movies. If you want to write a movie script, then write a movie script. For the few formulaic books that get adapted to movies, there are thousands – hundreds of thousands – that don’t. Many readers are not looking for a movie or they’d be watching a movie instead of reading. Unless you have been approached by a movie producer and asked to write a novel to adapt to the screen, don’t write it like a master movie script. 3. This tip states that your story’s lead should be sympathetic – all virtuous, likeable and full of character. This point alone is the most ludicrous tip of all. Creating a completly sympathetic character – one with no flaws – is a good way to create a boring, flat character in a strictly formulaic book. Everyone has flaws. Even Superman has his kryptonite, and Batman is a moody depressive. Your character mustn’t always be relatable. I’ve read gripping books where lead characters were sociopaths, had mental illnesses, or were unlikeable individuals. Give your leads variety – if your story requires a non-sympathetic lead, go for it. 4. This one isn’t so bad. In fact, it’s good advice. Sometimes, we think our antagonists/opposition characters must be portrayed as evil super-villians, but often the opposition might be the protagonist’s well-meaning family member or friend. In the novel I’m currently writing, one of the sympathetic characters becomes a “turncoat,” and one of the antagonists may just seek a type of redemption from her former behavior. 5. “Targeting the right wordlength” for your manuscript might have been considered back in the old days of publishing (and still has its merits when you’re differentiating between a short story, a novella, and a novel), but manuscripts in all genres are now of such varying lengths that if a publishing house requires particular wordcounts, they’ve fallen behind the times. For example, once upon a time, manuscripts written with the young adult market in mind were somewhat shorter in length (an average of about 50,000 words per book). The assumption was that teens and young adults had shorter attention spans and would never get through anything longer. That assumption turned out to be completely erroneous. Back when I was a teen, I found that my favorite books were of epic lengths (Hello, Lord of The Rings trilogy). Today, books like The Hunger Games trilogy and the Harry Potter series have completely turned those arbitrary word-length numbers on their heads. How long should your manuscript be? It should be long enough to tell the story. Never cut what you feel needs to stay, and never add filler to reach some imaginary perfect word count. 6. Subplots can be good things in some novels, but you don’t always need them. ‘Nuff said. 7. Where does this come from? Readers love surprises? Readers love surprises and twists if they’re integral to the story, say in an Agatha Christie mystery. Unnecessary surprises can be so jarring or out-of-place that they take the reader out of the flow of the story. Recently, I read a story that had so many “out of the blue” surprises, I became annoyed with them because they had no need to be there and didn’t drive the story anywhere. Rather than surprises, perhaps writers need to recognize when the story needs a twist or a subplot, or even an adventure. Most of us know, after all, that pages and pages of exposition or description can become boring. As long as your ebb and flow moves the story forward in an interesting way, it’s all good. If you do have surprises, though, you don’t need to have one every 1/4 of the book. 8. Resolve your story ending in whatever order you feel is best for the manuscript. Sometimes it’s nice to have the bigger resolution first, followed by smaller resolutions. Have you ever read a book that you felt ended too abruptly after the climax? Conversely, I’ve read stories that tried far too hard to tie every loose end into a neat little bow. Again, this is about how your story is best served. This is why I find beta readers so important when I’m wrapping up a novel. They can provide reader feedback on their satisfaction (or lack thereof) with your ending. 9.Uhhhhh – every section must have a designated section character? And what is “viewpoint writing” – are we talking first person, third person, omniescient? This is weird. Yes, your book needs to be one viewpoint (or several). Successful books have been written with multiple perspectives or one, present tense or past, first person or third. One book that comes to mind immediately as breaking this “rule of designated section characters” is Virginia Woolfe’s Mrs. Dalloway. The novel is written in a stream-of-consciousness sort of style, and perspectives jump so quickly from one character to another that it is often difficult to figure out whose thought process we’re seeing at any given time. And yet the book is a fascinating read and is taught in English Literature classes everywhere. 10. Okay, this one I can get behind. Yes, show the action of your story, don’t summarize it. Try to avoid passive voice. Show, don’t tell. **All of this is simply to say, if you want a formulaic book, fine, follow a formula. If you want a cookie-cutter story that’s been told 5,000 times (think Harlequin Romances of the 80s) and you are successful as a result, more power to you. 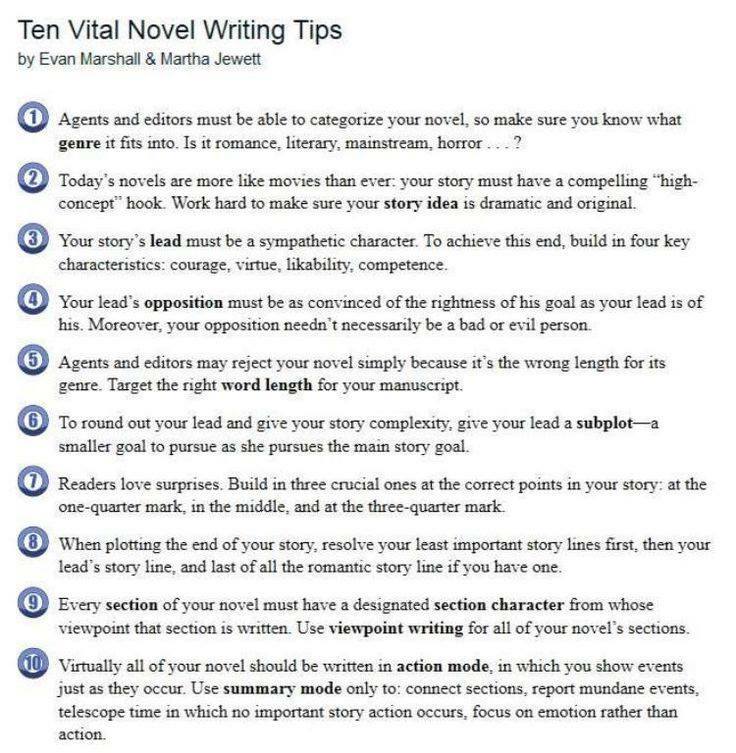 But don’t take those “vital” tips as vital if you don’t want flat milktoast characters or formulaic stories. Recently, in a New York TImes opinion piece, writer David Brooks argued that literature and the humanities had lost its way in that, rather than focusing on the inward person, to “cultivate the human core, that part of a person we might call the spirit, the soul…” (whatever that means), it has begun to focus more on the outward. Instead of focus on “truth, beauty, goodness,” he argues, now the focus has turned to political and social topics regarding class, race, and gender. I read his article and found myself wondering why he cannot see that these inward and outward focuses can be combined, and have been for centuries. One of my own focuses, as I have navigated the waters of returning to graduate school (English Literature with a bit of Psychology thrown in), is how authors have portrayed women…in particular, the “rhetoric of disempowerment,” as my classical literature professor/mentor has put it. For example, from further back than Shakespeare, I can follow a trail of how the humanities and literature have portrayed the disempowerment of women, especially that of women’s inability to speak for themselves –how they have been silenced politically and socially. Frances Burney, a predecessor and an inspiration for the literature of Jane Austen, peppered her literary form with both subtle and overt commentary about how all of the female protagonists in her novels were silenced, ignored, and controlled by patriarchal society. More recently, William Faulkner wrote what are considered great works of American literature that focused heavily on an “enlightened” Southern White Male’s views on racism and social class. I’m not a huge fan of 1,800-word sentences, but I have to admit that his works certainly focused on both the inward world of the “soul” and the outward world of race and social justice. Toni Morrison, one of the great literary novelists of our time, weaves those things together beautifully. Her often brutal (but honest) portrayals of black lives from slavery and beyond have heavily impacted both the literary community and activists for social justice. Why must it be one or the other? Do authors sacrifice the world of introspective thought and “feeding the soul” when they incorporate the issues of social class, race, or gender? Paula Moya, Associate Professor of English at the Stanford School of Humanities and Sciences, approaches literature as not only a rhetorical, introspective device, but as the perfect medium to approach attitudes about gender, race, religion or social class. I “defected” from graduate studies in Psychology (and many years working in various mental health and special education jobs) to Liturature, and like Moya, I find that literature can go a long way towards transforming an individual’s outlook on the world around her while still retaining beautiful, transformative language and imagery. I don’t classify my novels as “literary,” per se. Currently, I’m writing for young adults (and those adults who like YA fiction), in the speculative fiction genre. I’m working on the second book of an apocalyptic/dystopian series. I’m also doing some academic writing and will be writing a graduate thesis soon. My second book will focus heavily on issues such as gender and empowerment – or disempowerment, in a few cases. I’ve had a few people tell me that’s a mistake – that my protagonist’s having a “feminist” idea or three devalues the “literariness” of my work. I disagree, but hey, even if it does, I’m willing to risk it. I have every respect for those still trying to get traditionally published, or who have been. I wish you the very best. But not me, not anymore. I tried for years to get my work noticed in the traditional publishing route, mainly to see that nobody was even reading my work. Straight to the slush pile. I stopped writing for over a decade, until I began to hear more good things about independent publishing. In 2012, I put one short story up on Amazon for Kindle, as an experiment. After two years, I still sell one or two copies a month. I’m okay with that – it was an experiment. Today, I entered that story into Amazon Select (it stays exclusively on Amazon and is sold nowhere else), which also now includes Kindle Universe, Amazon’s new paid-monthly service. Why not? 1. In traditional Big 5 publishing (and let’s face it, smaller houses exist in very small numbers these days), publishers focus primarily on A-list and celebrity authors, giving them multi-million dollar advances in hopes that they’ll make that money back. Mid-list authors average (if any) about $1200 advances. Because traditional publishers don’t do a lot of marketing anymore, I’ll still be responsible to get my name out there. I may never see another penny, because if my book doesn’t take off, stores will send it back to the publisherm and the book will go sit in nowheresville. In independent publishing, I can get beta readers and an editor for myself (I’m lucky enough to have friends who are professionals but will edit my work for free). I market my stuff, and I can both e-pub and offer print copies of my books. 2. In traditional publishing, you almost always have to have an agent (who takes a cut), then the publishing house (which takes a huge cut). The publisher would decide the cost of your print and e-books. In indie publishing, I make a 35% to 70% royalty on every sale. I can price my own book. Thus far, having my novel out for less than a month in e-book, and only a week in print, I have made only about $200 total in royalties. BUT – in traditional, my book would be accepted, but probably not even put out for another 18 months, so I’d making nothing for one to two years, if at all. More importantly, my work wouldn’t be out there for anyone to access. Frankly, for very little marketing (i.e., just talking about it on social media), I’m feeling pretty good about the sales. I don’t expect to get much more until the next two books in the trilogy are out. But even if I don’t make a lot in the first year…my work is out there, and I’ve made more already than I would have, because my book is out – not sitting in a queue. 3. Control – I control my own work. My beta readers and editors make suggestions, but in the end, it’s mine. 4. Time. In traditional publishing, my book has a very narrow window of time to either be successful – or not. If it’s not an immediate success, stores will pull it from shelves. The traditional publisher will still own the copyright for however many years we contracted for. Which means, it’s dead until I get the copyright back. Even if my indie published book sells slowly, there is not time limit. 5. Reports are now attributing independently published authors making more on average than traditionally published books. Anyway, mostly it’s having my own control over my books and over what I charge for them. I’m only on Amazon right now (Kindle and print through Amazon’s Createspace), but am headed out now to get it on Barnes&Noble, Kobo, Sony, and a few other places out there. That’s another point – I control where my work is displayed.